The Message International Magazine is a bi-monthly magazine published by ICNA. What you find in ‘The Message magazine’ is a universal publication for the whole of Muslim community. Echoing the concerns and ideas pertaining to Muslims in America, this non-profit publication is a forum for the youth searching their Islamic identity in a western land. Prophet Muhammad, peace be upon him (pbuh), delivered to mankind a criterion of ethical and moral values. The Quran is al-furqan, the divine message that provides the criterion of right and wrong, allowing man to discern what is true from what is false. It is well known that the Prophet, said, “Seeking knowledge is incumbent upon every Muslim, male and female” (Ibn Majah). But the aim is knowledge imbued with a beacon of light to move an individual along the path, from rules and rituals for their own sake into the realm of discernment and meaningfulness, thus producing wisdom. When Prophet Abraham and his son, Ismail, (peace be upon them) were building the house of worship, they prayed, “O our Sustainer! Raise up from the midst of our offspring an apostle from among themselves, who shall convey unto them Your messages, and impart unto them revelation as well as wisdom…” (Quran 2:129). Buttressing the point that it is not just knowledge we are after, but knowledge that is applied with discernment so that we act in a clear-sighted and judicious way, the Prophet used to supplicate, “O Allah, I seek refuge in You from useless knowledge.” This dua points to the application of knowledge to improve ourselves, moving beyond a superficial knowing of information or facts to a deeper understanding so that we choose to apply that knowledge and move our hearts. Thus, Imam Al-Hassan Al-Basri, may Allah have mercy on him, said, “There are two kinds of knowledge: knowledge of the tongue, and knowledge of the heart which is the beneficial knowledge. Knowledge of the heart raises people in rank. It is the inner knowledge which is absorbed by the heart and puts it [the heart] right. Knowledge of the tongue is taken lightly by people – neither those who possess it or anyone else act upon it.” So acquiring knowledge of the heart is useful and beneficial and a pathway to wisdom. ‘The job of a physician is to accept. He doesn’t typically see healthy people, does he?’ I replied. ‘Of course, you advised her to wear hijab!’ he added. Two weeks later, the girl came back. She was wearing much more decent clothes with a scarf over her head. She resumed her questions and I resumed my teaching. Then I asked ‘Why don’t you go to the nearest mosque to your home?’ I said that but immediately I felt remorse. I remembered that mosques are closed in the face of Muslim women. The girl answered that she hated the people of religion and that she did not like to listen to them.’Why?’ I asked.’They are hard-hearted, and they treat us with contempt and scorn,’ came her swift reply. Notice that the Shaykh said, “I can’t drag Islam by its tail as you do. I lay the foundation and then start building and I usually achieve what I want with wisdom.” In fact, the young man, “on whom qualities of outward Islamism were apparent,” was quick to judge, calling the young woman “wicked,” without knowing anything about her. Then he revealed his moralistic and doctrinaire frame of mind by stating (again, knowing nothing about her and her background and upbringing or her issues and concerns), “Of course, you advised her to wear hijab!” Contrast that with the Shaykh who said he listened to her “as long as needed.” His intention was to wisely guide the young woman with attitudes and a demeanor in his interaction with her that reflected the ways of the Prophet with “his lenient manners,” his “kindness and sympathy [that] changed the hearts of the people around him.” The Shaykh contrasts this with the mannerisms and approaches that are used by some people. Through the young woman’s words, their ways are described as hard-hearted, contemptuous, and scornful. Shaykh Al-Ghazali says that these attitudes and behavior drive people away and “repel” them from Islam. Ibn Masud said that he heard the Messenger of Allah saying: “There is no envy except in two instances: a person whom Allah has endowed with wealth and he spends it righteously, and a person whom Allah has given wisdom and he judges by it and teaches it to others” (Bukhari, Muslim, and others). How utterly true it is that the Prophet lived according to the mandate of wisdom, judged by it, and taught it to others. The deep connectedness of self-restraint, growing in purity, and wisdom is easily recognized and understood. And the Prophet has mentioned something that facilitates the growing in purity: silence. “Whoever is pleased to be whole and pure, let him practice silence” (Ibn Abi Al-Dunya and Al-Bayhaqi). Jaber ibn Sumarah, as reported in Ahmad and Al-Tabarani, said, “I used to accompany the Prophet and he was silent most of the time.” So silence can foster wholeness and purity. Can it get better than that? Actually, yes. The Prophet said, “Shall I tell you the easiest and richest form of worship and the most comfortable for the body? They answered, ‘yes O messenger of Allah.’ And he said, ‘silence and good character’” (AbiDharr in Tabaqat Al-Muhaddetheen). So what we’ve got here is this: practicing silence helps to produce and bring forth wholeness and purity of the soul; practicing silence is a form of worship; in fact, it is the easiest and richest form of worship, along with good character. These are extremely important signifiers that practicing silence is of great value. Self-discipline is the capacity to exercise control over our own selves, to behave in ways that serve our intentions and goals. It’s necessary to cultivate self-discipline if we want to achieve success in this life and in the hereafter. Lacking self-control leads to indulgence in impulsive or habitual attitudes and behaviors that disregard outcomes. Realizing that an action has consequences, either positive or negative, and that we can make a choice at each and every moment of our daily lives, is the first step toward the realization of self-governance. For, in fact, each step we take brings us closer to realizing our ultimate success or failure. Al-Hasan Al-Basri, on his deathbed (may Allah have mercy on him), was asked by some of his companions for advice. One of the things he said was, “Know that the steps you take are two steps: a step in your favor and a step against you, so be careful where you come and where you go.” This is confirmed by what the Prophet (pbuh) said: “Each day a man is a vendor of his soul- either setting it free or bringing about its ruin” (Muslim). The capacity to govern the self affects every aspect of our lives, including physical and mental health, relationships — particularly marriage and parent/child relationships — career, school, and of course, religious practice. “He grants wisdom unto whom He wills: and whoever is granted wisdom has indeed been granted wealth abundant. But none bears this in mind save those who are endowed with insight” (Quran 2:269). Self-discipline, restraining oneself from harmful behaviors and speech, recognizing one’s weaknesses in order to purify the heart and soul from all that defiles, slowing down in order to increase awareness and engage in reflectiveness and find joy in the simplicity of humbleness – all of that is supported and facilitated by the practice of silence.It is in silence that one can engage in remembrance of Allah SWT. Silence is the place for reciting gratitude for the blessings in one’s life. In silence, our capacity is expanded for observing the world and other people, as well as our own attitudes, words, and actions. The practice of silence gains one entry to the world of reflection, mental clarity, spiritual energy, calmness of heart and mind, and increasing of concentration and focus. Sitting in silence and enlisting oneself in quietude, with all its attendant occupations of the soul in seeking goodness, is the enterprise that delivers the richness that the Prophet said is true richness – richness of the soul. 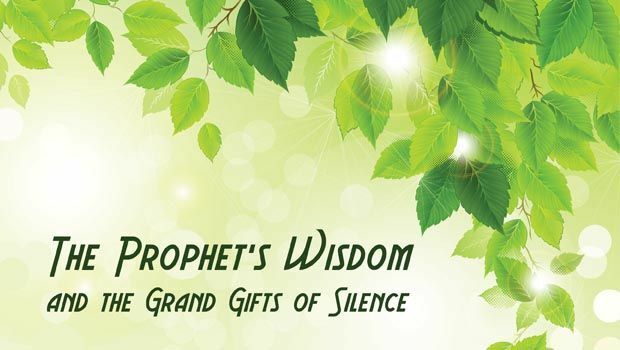 The Prophet pbuh was the exemplar of self-restraint, purity of soul, and wisdom. In all his dealings with family, companions, and even those who opposed him, his lenient manners, his kindness and sympathy for the people, were evident. He had an acute sense of the various levels of people’s understanding and maturity. He understood so well what Allah SWT says in the Quran with regard to being gentle with the people: “It is part of the mercy of Allah that you deal gently with them. If you were severe or harsh-hearted, they would have broken away from you…” (Quran 3:159). This is further accentuated by statements by the Prophet: “Allah is kind and He loves kindness; and He confers upon kindness that which he does not confer upon severity, and does not confer upon anything else besides it” (Muslim and Abu Dawood). At another time he (pbuh) said, “Kindness makes things beautiful; absence of kindness makes things defective” (Muslim). And further still, “Whoever is deprived of rifq (kindness, gentleness, friendliness) is deprived of all virtues” (Muslim). Any description of the Prophet’s way of living and teaching and interacting with people can only be seen as accolades for his wisdom. By all accounts, he was modest in the most pleasing and honorable way. When he approached a gathering, he forbade people to stand up for him and he would sit wherever a place was available. He, a Prophet of God, sat among them just like any ordinary person. He treated all alike with respect and honor. When he spoke to an individual, whatever the occasion, that person would feel as if the Prophet were fully attentive and interested in him and what he was saying, listening with utmost patience until they had completed their talk before responding. When at home with his family, he was cheerful and pleasant. Aisha (may Allah be pleased with her) reports, “Whenever the Prophet was alone with his family at home, he was the easiest of men, always smiling and laughing.” If he was served by anyone, he was the first to serve others. When he was not attending to his prophetic duties, he was helping in the domestic chores and responsibilities. He used to repair his own shoes and mend his own clothing. The household servants were fed and clothed the same as the Prophet was. Prophet Muhammad (pbuh) was the most eloquent and fluent, yet unpretentious and straightforward in his manner of speaking. He spoke when necessary, but often remained silent for a long period. When he did speak, it was decisive and to the point. If he heard some news of a person’s inappropriate or bad behavior, he would never name the person, but rather would say, “Why do certain people do so and so…” The Prophet (pbuh) never focused on or sought out the shortcomings of others. Neither did he disparage people. Rather he was the most forbearing and forgiving, always looking to teach and inspire the people to improve themselves, by his own example. And, finally, we can add one last grand gift of silence: the Prophet, peace be upon him, said, “Indeed, silence is wisdom, but very few practice it” (Al-Bayhaqi and Ibn Hibban).